The UFC is targeting a bout between Karolina Kowalkiewicz and Jessica Andrade that could serve as a #1 contender fight. Brett Okamoto of ESPN first reported the bout as it is being targeted for the upcoming UFC 228 pay-per-view event. 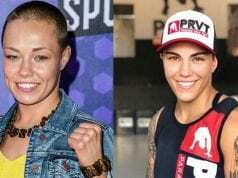 It’s likely that the winner of this fight could become the new #1 contender for Rose Namajunas’ UFC women’s strawweight title. It was noted that the bout has been verbally agreed by both parties and that contracts will shortly be out for the showdown. Kowalkiewicz (12-2) is currently on a two fight winning streak as she has picked up wins over Jodie Esquibel and Felice Herrig in her latest outings under the UFC banner inside of the Octagon. She does have experience fighting for the UFC title as she took on then-champion Joanna Jedrzejczyk at UFC 205 in Nov. 2016, but lost via a unanimous decision at Madison Square Garden in New York. On the flip side, Andrade (18-6) is also riding a two fight win streak as she holds wins over Claudia Gadelha and Tecia Torres. Andrade has also fought Jedrzejczyk for the strawweight title and was defeated via unanimous decision at UFC 211 in May 2017. The UFC 228 pay-per-view event is set to take place on Saturday, September 8, 2018. As of this writing, the promotion has yet to reveal a location and venue for this event but Dallas and Las Vegas are believed to be leading the running.